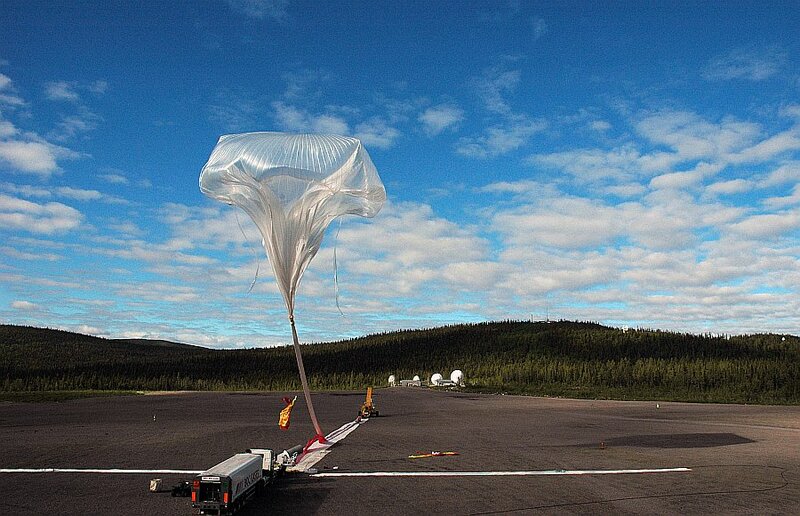 The MEAP (Mars Environment Analogue Platform) was a technology test mission for future long duration balloon flights around the North Pole during summer time. 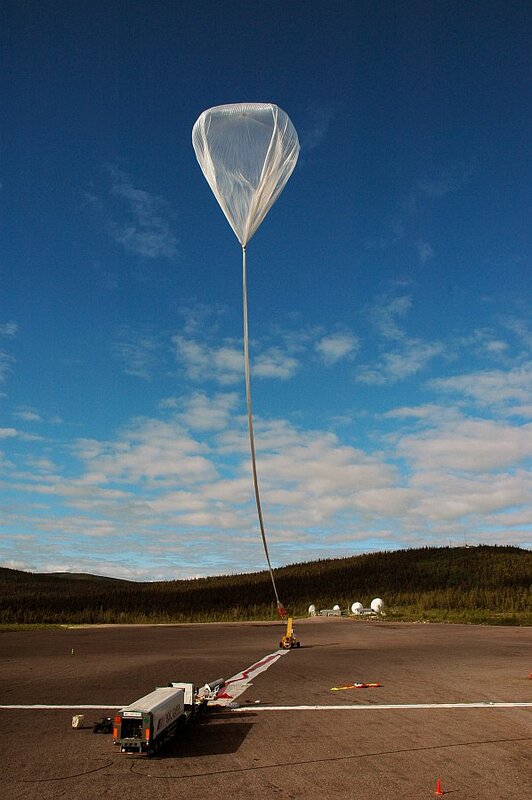 As the conditions in the stratosphere between 30 and 40 km of altitude are similar to the conditions at the Mars surface the balloon flight opened up the opportunity to verify instrumentation and equipment for Mars landers under quasi-real conditions. The gondola main platform, whose scheme can be seen at left (click to anlarge) was built from a composite honeycomb plate of 1.6 m x 1.6 m with reinforced attachment rails for the payload. An aluminum frame of 1.2 m height provided support for the roof of the gondola. A secondary platform right under the roof provided additional mounting area for more lightweight equipment. All four sides of the frame structure were closed by aluminum panels painted of white. Solar panels were suspended on each side in a frame below the main platform. Solar cells were fitted directly to lightweight aluminum honeycomb plates to save mass and to serve as shock absorbing structure during landing. The ballast container was suspended using wires underneath the main platform between the solar panels. Several booms extended from the main platform, the longest with 3.7 m length supported the gas inlet filter for the P-BACE instrument, two short booms were used to get sufficient spacing between individual global positioning system (GPS) and Iridium communication antennas to avoid interference. The platform is powered by a total of 8 solar panels, two mounted on each side tilted 75 degrees from horizontal for optimum Sun illumination. Each pair of panels provided more than 240 W when fully illuminated charging two independent 24 V/48 Ah gel lead accumulators. Two platform control systems were flown on the mission MIP (Micro Instrumentation Package) and MSITel (Multi-Source Iridium Telemetry). MIP uses for line-of-sight control two VHF radio links, while for beyond line-of-sight it has two built-in Iridium satellite modems for command and control. MIP also have two independent GPS receivers to provide localization data. 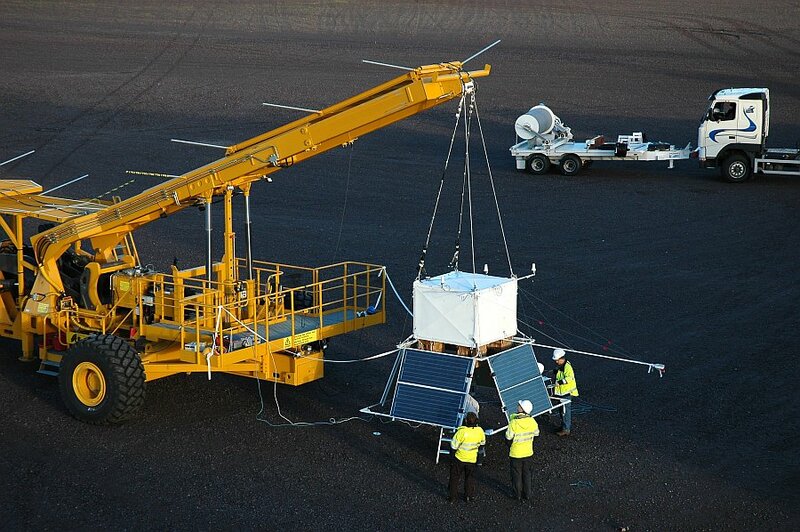 MSITel, was developed by LEN (Italy) and during the flight was used to control the platform power system, to provide gondola housekeeping data and to simulate balloon control as a test for future missions where only the MSITel system will be installed. MSITel uses two external Iridium satellite modems for telemetry and commanding and also like MIP counts with two independent GPS receivers. As a backup system, the Automatic Position Report System (APRS) also transmitted the gondola position via VHF while inside air traffic controlled areas, the onboard transponders were activated. Finally a passive radar reflector together with a strobe light was connected to the flight train for easy location in flight. The scientific payload carried on the MEAP gondola was P-BACE (Polar Balloon Atmospheric Composition Experiment), a neutral gas mass spectrometer of the time-of-flight type for the analysis of ambient atmospheric gas which was originally developed to study the Martian atmosphere from a landed spacecraft. It consists of a sealed pressurized vessel containing most of the instrument and an external gas inlet system with a micro particle filter at the end of a 3.7 m long boom. The system received and transmitted telecommands and telemetry via its two own Iridium satellite modems with integrated GPS receivers, independent of the platform communication systems. 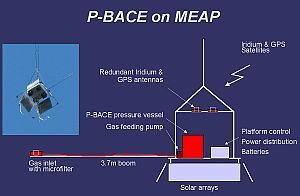 This separation simplified considerably the interface between P-BACE and MEAP. During the flight, this communication link can be used to optimize instrument settings and to download quick look science data. Full science data is stored onboard on two redundant solid-state disks, to be recovered after the flight. After several attempts the balloon was launched by dynamic method with assistance of launch vehicle (Hercules) on 28 June 2008 at 5:07 UTC. 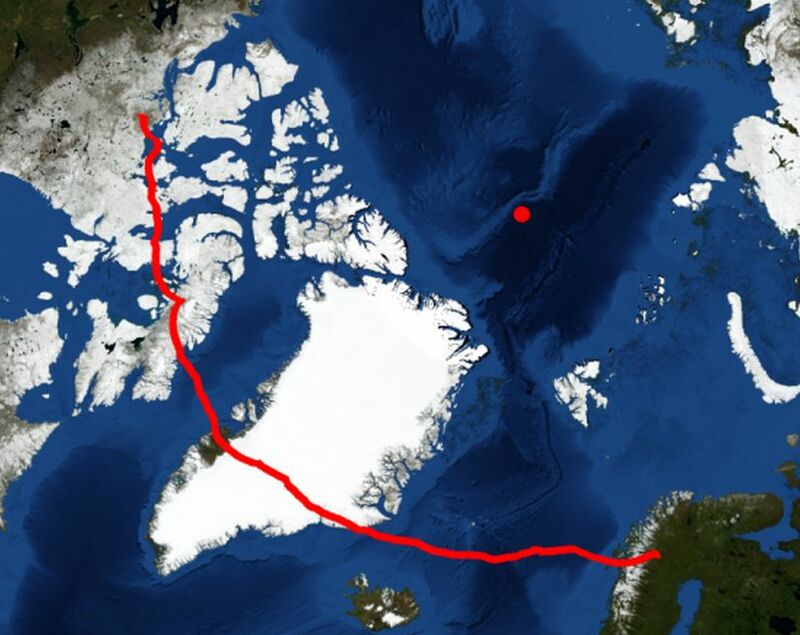 After a nominal ascent phase that endured two hours and twenty two minutes the balloon reached a float altitude of 38 km, starting an westeward flight route over Sweden, Norway and then entering in the Atlantic Ocean. The flight lasted for 116 hours at an altitude between 33 km and 38 km traveling a distance of more than 5800 km. Termination commands were sent to the balloon from the recovery aircraft at 00:26 utc on 3 July 2008. 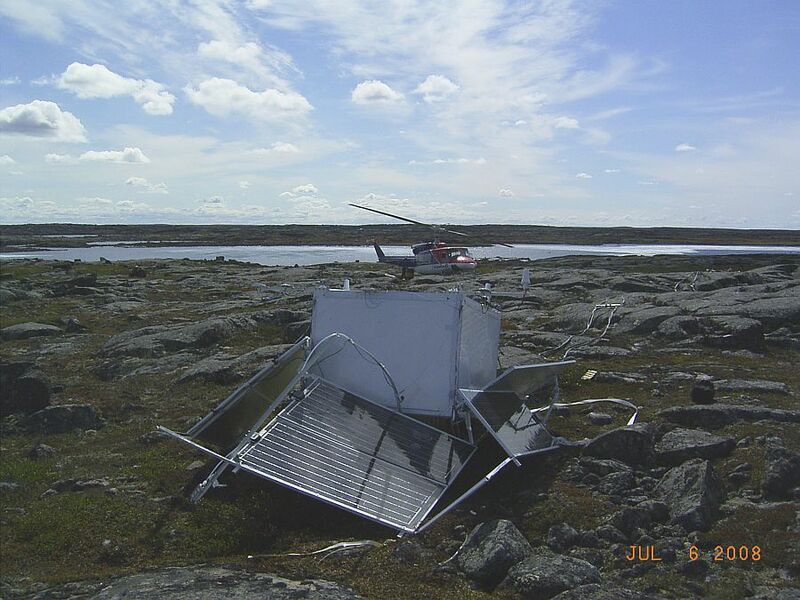 The descent on parachute took about 44 min and was closelly observed by the termination team until 1:10 utc when the gondola hit the ground in a point located 135 km east of Umingmaktok, Canada. The gondola landed on dry soil from where it was recovered successfully. 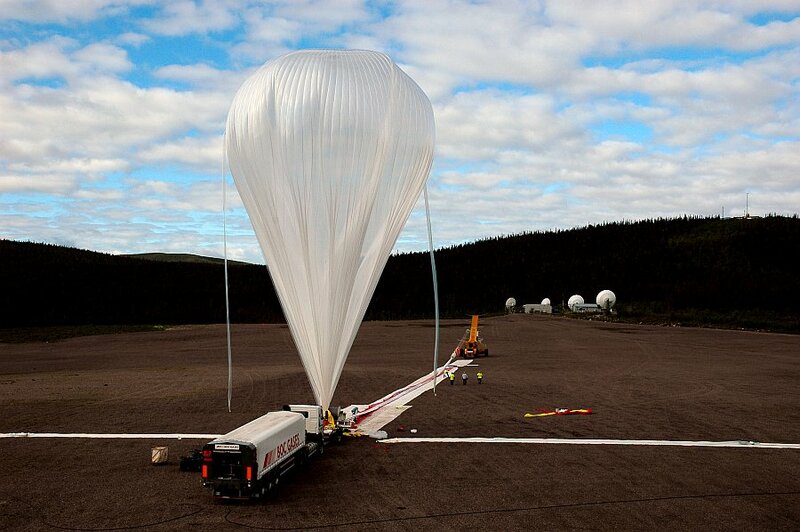 Primary mission objective for MEAP was balloon platform technology validation. This included a new power distribution system for the balloon platform including solar arrays, the thermal design of the gondola and satellite based communication and tracking systems for both platform and payload. The platform performed nominal throughout the mission. The solar arrays provided sufficient power to keep the batteries charged to 100% for most of the flight and the power distribution system performed nominal. Measured temperatures remained within predicted limits, including the temperature of the scientific payload P-BACE. The MEAP gondola survived the landing intact, with the solar panels crashed as designed. MEAP was able to continue transmitting GPS position data via Iridium even after landing. Primary mission objective for P-BACE was to verify instrument design and operations under flight conditions while secondary objectives were atmospheric science questions: at an altitude of 40 km in the terrestrial atmosphere is close to the upper end of the ozone layer where photochemical reactions are favored by the absorption of solar UV photons, thus, a large variety of complex molecules are expected. Possible in-fall and decomposition of meteorites delivers Si, Mg, Ca, Fe, and other atoms that serve as catalysts for chemical reaction in the middle atmosphere or may be incorporated in chemical compounds. The high mass and time resolution and the high dynamic range made P-BACE ideally suited to investigate these processes. Durint the flight, a total of 4538 high-resolution mass spectra were recorded onboard during the flight, of which 2% were downloaded already during the flight for quicklook purposes. P-BACE was in science mode for about 71% of the time, the rest was spent in engineering and test modes.